When I hear the word blacksmith, I immediately think of the remote smithy in Dickens Great Expectations. The name itself has a sound of yesteryear, when hammers echoed in every hamlet and when blacksmiths were the heart, or certainly the hearth of every community. As unfortunate as it is, these days the smith-trade has been gradually replaced by superglue and landfills. Try finding someone who can make a one-of-a-kind door knocker or a custom-built iron gate from scratch and you will pay through the roof. That is, if you can find someone to do it. 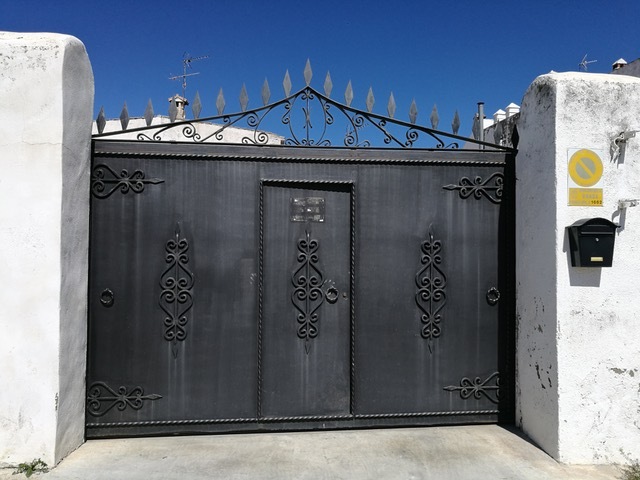 For this reason, we were very excited when we heard that there were still smiths working in Andalucía, even one in our very own barrio or neighbourhood. His name, they said, was Pedro, El Herrero. It didn’t take long before we needed our local smith. Our first task for him was to make a custom firewood stand, based on our rough sketches. We went to his workshop several times, always coming to a locked door. Actually, the black metal garage doors of the smithy had no business sign, and not even a forged handle to somewhat indicate what trade was practised inside. 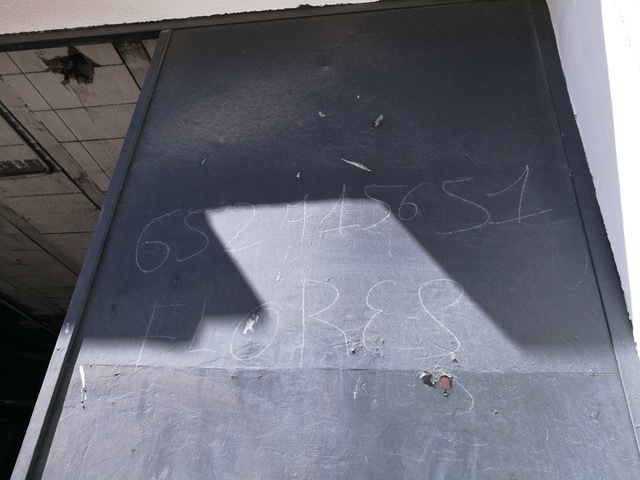 Instead, there was a phone number scribbled in chalk on one of the flat door panels. Clearly, Pedro believed in the bare-bone rural Andalusian way of advertising. Knowing there was a smith in town and actually locating the man seemed to be entirely different matters. Our neighbour Mo said that we might have better luck finding him at the stables half way down the hill towards Ronda’s tajo. If he wasn’t there, we might run into him riding up to the barrio. Failing this, we could ask for him at one of the local bodegas, which indeed is what we did. Wherever we went, everybody knew Pedro. In fact, if we were to believe them (and we did), the smith seemed to have been in every bar we dropped by. The man must get around, as we always seemed to have just missed him. A few days later we saw a man sitting on a horse outside one of the before-mentioned bodegas drinking a cerveza, while chatting with some of the other patrons. He had dust-covered clothes, worn leather boots, and just a hint of sooth on his handsomely rugged face – a perfect cast member for a Spanish Spaghetti Western. So, this was the legendary Pedro el herrero, or Peter the blacksmith. Blacksmiths have a long history. Hammering metals has been done since the early Bronze Age, though classic smithing started in the Iron Age when it was discovered that certain rocks would let out liquid metal when exposed to heat. This iron would gradually solidify upon cooling, allowing it to be formed into tools and weapons. These were much sharper and tougher than their stone predecessors, while being more readily available and diverse in use than bronze tools. Evidence of smithing is found in Greek, Roman, Phoenician and Aztecs mythology, while the earliest archaeological discovery was a dagger dated to about 1350 BC. In other words, it is a very old craft. 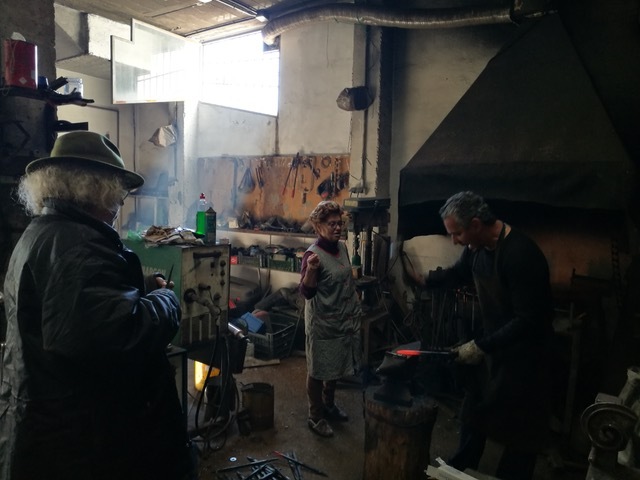 Throughout the centuries, the role of the smithy grew. By the 1300s, iron horse shoes were in general use throughout Europe. In Medieval times, blacksmiths were not only making relatively advanced tools out of simple sheds, but they also performed certain community services, such as removing abscessed teeth and probably the odd amputation. The smith could therefore be seen as the equivalent of the town’s engineer, surgeon, dentist, horseman toolmaker and veterinarian. In many cases, he would be the most learned man around. It was a profession that commanded respect and one of the first trades to develop a system of apprenticeship and education of journeymen. 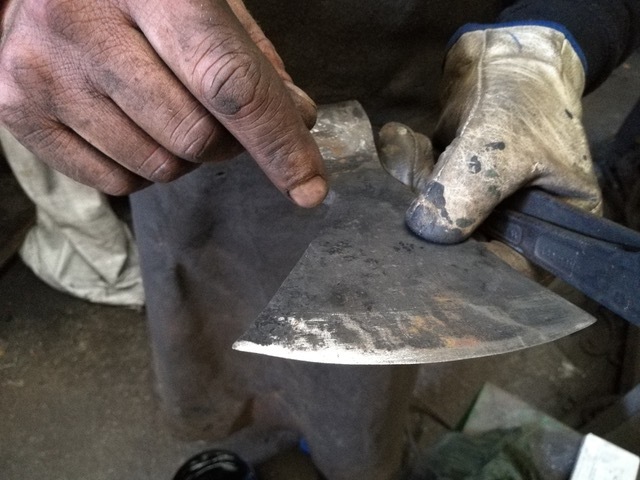 Though now considered a blue-collar trade, being a blacksmith in the past was a sign that one had certain intellectual abilities and possibly even partial literacy, since shillings and coppers would have to be accounted for. As demands for tools grew, the smith profession became more specialised. Traditional smiths were replaced by armourers, nail smiths and sword smiths. Whitesmiths worked with lead, while blacksmiths were the ironworkers. Smiths were still abundant, as witnessed by the frequency or the surname Smith or Herrero here in Spain. Yet, the days of the county forges were numbered. Their demise began with the decline in horse transport and animal labour and ended with the industrial revolution. Big machinery required large production facilities, while mechanised urban tool manufacturers replaced the village smiths. Though inferior in quality to the hand forged tools, these mass-produced generally mixed metal products were much cheaper to make. Such is the way of progress. Just take the good old horseshoe. Though iron horseshoes still exist, most horseshoes today are manufactured of a blend of materials, such as steel, aluminium, plastic, and even rubber. 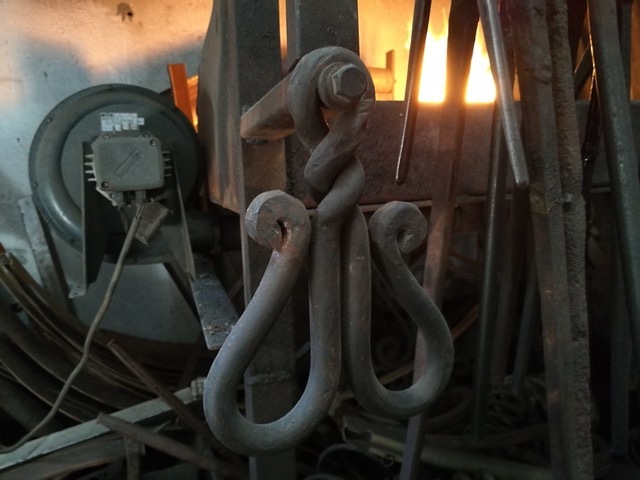 It is a long time since people went to the smithy for a change of horseshoes, so do blacksmiths still have a role to play in our society? Back in Ronda, Pedro the blacksmith was sitting high on his horse, nursing his second beer. My husband and I went over to inquire if he was available to do a small job. He agreed and we made plans to visit his workshop the next afternoon. 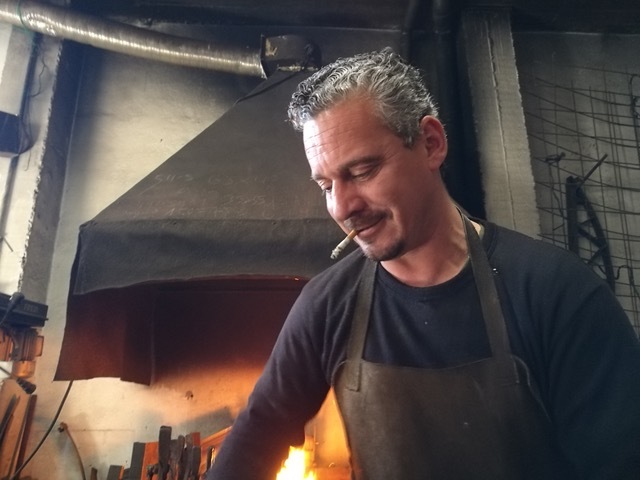 What does an ironsmith in the 21st century rural Andalucía do, we wondered? Judging by Pedro’s shop, he won’t be out of work soon. There were half made fences, gates, hand tools, lamps and hinges. There appeared to always be an old neighbour or two hanging around the shop, shooting the breeze and interrupting his hammering. Most, if not all, of his jobs appeared to come by word of mouth. Local farmers used his services, as did anyone with a horse cart or a campo finca. In addition, with Ronda’s historical town centre needing custom door hardware or classic window bars occasionally replaced, Pedro probably had his future set out for him. Of course, things have changed a bit. A 21st century smithy doesn’t look completely like my movie set image of a classic forge. Pedro’s shop has a few florescent tubes dangling unceremoniously about and a dirty boom box playing a modern Andalusian beat, letting one know that the herrero is in the house long before one gets there. Yet, the basics are the same. The main tools are anvils, tongs and hammers. There is still sooth abound and a smell of seared metal. And there are still embers, even if they more frequently come from the end of Pedro’s cigarette. Though he isn’t the only act in town, the other smith is getting too old and no longer wishes to work the forge. Pedro literally grew up in the smithy, learning the trade from his now retired father. At 35, our local smith has worked in this same workshop since he was about 12. When I ask him if there is a school for herreros, he laughs, his bright teeth contrasting his blackened face. This is a trade you learn on the job, he tells me. Though there are modern style metal workers in town, he is the only one in Ronda who still uses the classic forge and makes tools by hand. Regrettably, not a single young rondeño is looking to learn his trade. Nobody is interested in getting their hands dirty, I suppose. But Pedro loves his craft and couldn’t imagine doing any other job. His work is creative and innovative. There is always something new to learn and try out. He is his own boss and sets his own hours. He can smoke on the job and spontaneously set off on horseback, just locking the door behind him. The costumers know him and will understand. The latest piece Pedro made for us was a custom-designed auxiliary table. He had a quick peak at my chicken scratches and understood exactly what we wanted. It would be ready in a couple of days, he said. Since we are used to the mañana culture of the southern Spanish, we didn’t expect to hear from him for a couple of weeks. Yet, the next afternoon he called and said that it was ready for pick up, primed and all. When we went to his shop, Pedro had the forge going, making arrow shaped attachments for an enormous gate. The sound of his hammering followed a certain musical rhythm, the same that in the past have inspired chain-gang songs and Andalusian flamenco music. Pedro was puffing as usual and wore a leather apron and a single glove as his sole protection from the flames. On a dust filled tables we discovered half a dozen beautiful axe heads. 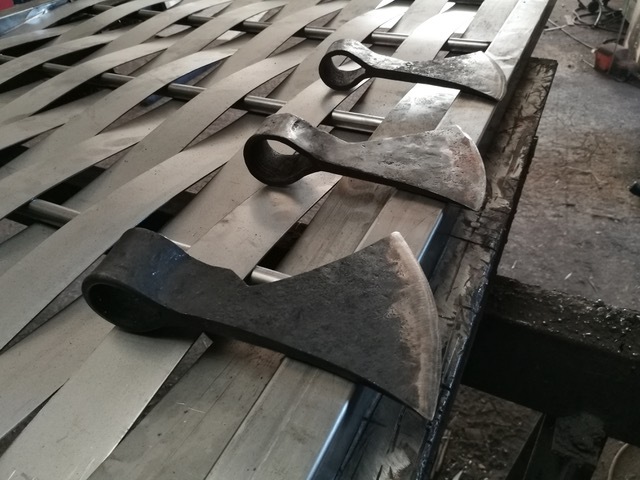 Pedro explained that he makes these from scrap metal, shaping the part to go around the handle with hammer and tongs and doubling the metal over and over again to create the crescent shaped cutting edge. How much would one cost, my husband inquires and was told 40 euros. Granted, this was a bit steeper than the price of a factory-made axe, but there was no comparing store bought types with this beauty – a cross between a medieval battle-axe and a Viking storm trooper cleaver. The very same tool had been used for the cork harvest as long as anyone could remember, Pedro told us. 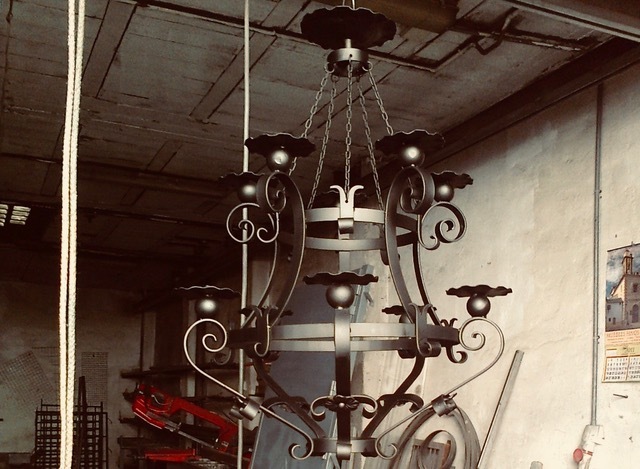 The metal had to be heated in the forge and hammered, in between being immersed in what looked like black crude oil to acquire the right hardness. Pedro hit a crucifixion-sized nail to the edge of the axe head in his hand. It gave a pure bell-like sound. Cork harvesters know exactly what axe head they prefer from the feel and the sound of the metal, Pedro told us. Then, like a musician testing an instrument, he tried another one with a slightly lower pitch. The axe head came home with us, of course. Pedro even thrown in a handle made from lemon wood, apparently one of the hardest there is. Our new tool would be more than sufficient for our modest use of splitting kindling for the fireplace, we thought, coveting our priceless piece of Andalusian history. This art is precious – and useful too.